When you are trading the financial markets you should appreciate that price is moving in a sequence of oscillations with each one possessing a bottom and a top. Such configurations can often represent serious reversals identifying levels at which price often changes direction. 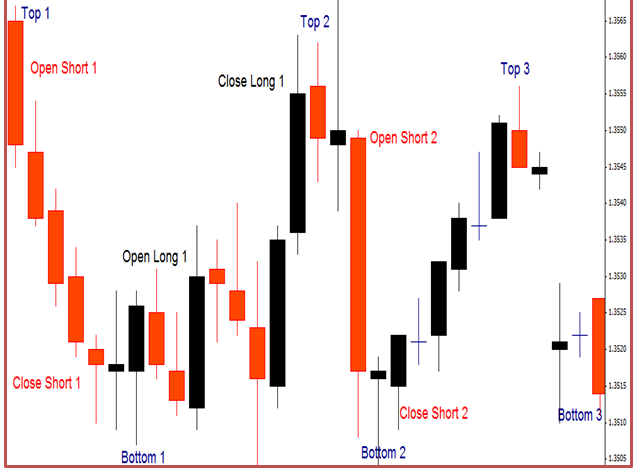 A favorite trading strategy is to identify a top or bottom and then trade to the next opposite one i.e. enter at a top and trade to a bottom or enter at a bottom and trade to a top, as shown in the next diagram. Your primarily aim when deploying such a technique is to try and detect tops and bottoms as accurately as you can by using techniques such as the following. You can choose to utilize scientific formulas, such as the Elliot Wave, W D Gunn or the Fibonacci theories, each of which is based on the premise that market behavior repeats itself. However, if you simply just base your strategies on such theories, then experts advise that is not a wise practice and could produce indifferent results. One of the main reasons for this is that the financial markets are not totally predictive in nature and the best you can attempt to achieve is to determine the probabilities of their next moves. This means that, if you just try and predict a market’s next move, you are not playing the odds and consequently will most likely lose. In addition, a currency market, such as the Forex, advances in a way that prices cannot be predicted. As a consequence, scientific theories should be used with caution and, then, only in conjunction with other confirmation techniques. Other traders base their strategies on the favorite trading maxim which is: “buy low and sell high” but this concept is not so easy to implement as it sounds. In order to detect a bottom, you must search for a support level against which price has bounced against a number of times. Once achieved, you can then set an entry condition to buy, as displayed on the above chart. The flaw with this type of action is that you would be only guessing or even gambling that the support will hold next time. As you would not be placing the odds in your favor by performing such actions, the chances are that you could experience many failures by doing so. Instead and to increase your chances of success, you should wait and confirm that the support will hold. You need evidence that the support does remain intact and, that the market has generated enough momentum to drive the price back upwards, before you consider entering a new trade. As trading the financial markets is about odds and not certainties, your prime objective is to target more wins than losses in order to ensure success. There are a number of techniques that you can deploy to assist you in accomplishing this objective. One such method involves you studying weekly and monthly charts with the prime intent of detecting ‘tops and bottoms’. Specifically, you must attempt to locate those price levels against which price has rebounded numerous times. Once achieved, you should next draw lines connecting the peaks and troughs in order to create resistance and supports lines for all applicable assets. These lines will then present excellent chances of opening new positions on rebounds. This will be especially so you can also detect evidence of momentum buildup in the reverse direction. Another method you can use is to spot great levels for reversals is to locate psychological levels of any asset of interest, i.e. 1.2000 for the EUR/USD. These numbers not only seem to have some kind of effect on the minds of traders but also provide high quality trading opportunities. Again, adopt cautious by using confirmation strategies to verify that price has sufficient momentum to advance in its new direction after bouncing against these important levels. Whenever you are searching for such levels as described above, always remember that even if price pierces through them, then you must not quickly jump to a conclusion that a real breakout has occurred because this action could still just result in a fakeout, as illustrated on the next chart. 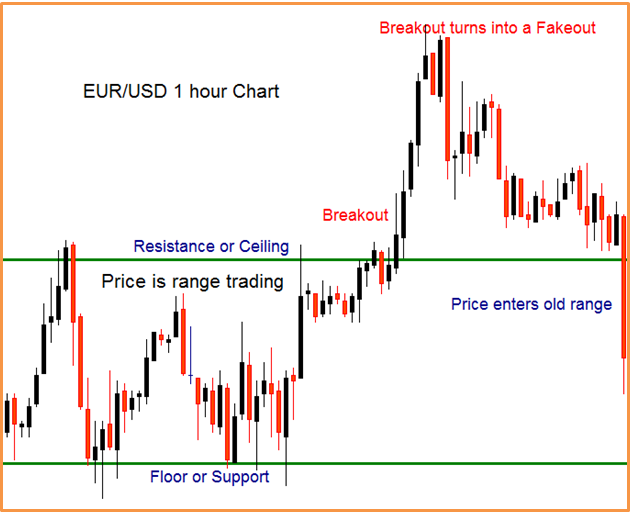 To overcome this problem, you should deploy a stop-loss in the region of 100 pips. By doing so, you would not only provide extensive protection for your account balance from fakeouts but would also open new positions possessing excellent reward-to-risk ratios.